I’m a sentimental sort. For over a decade now I’ve kept a wall calendar as a way of documenting my life – where I’ve worked, who I’ve lunched with, what movies I’ve seen, where I’ve travelled, sick days, that sort of thing. I’ve also for as long as I can remember collected and kept memorabilia. Movie tickets, theatre and exhibition tickets, theatre programs, festival and hospital wrist bands, business cards of places I’ve been, you name it. At one stage I had many overflowing boxes of memories – yep! Confessions of an organiser here! Years ago I went through my memorabilia collection and weeded out items that had lost meaning to me. It helped make the collection have a structure but there were still a lot of loose pieces of memorabilia that, out of context and so far from their origin, would mean little to me in several years. 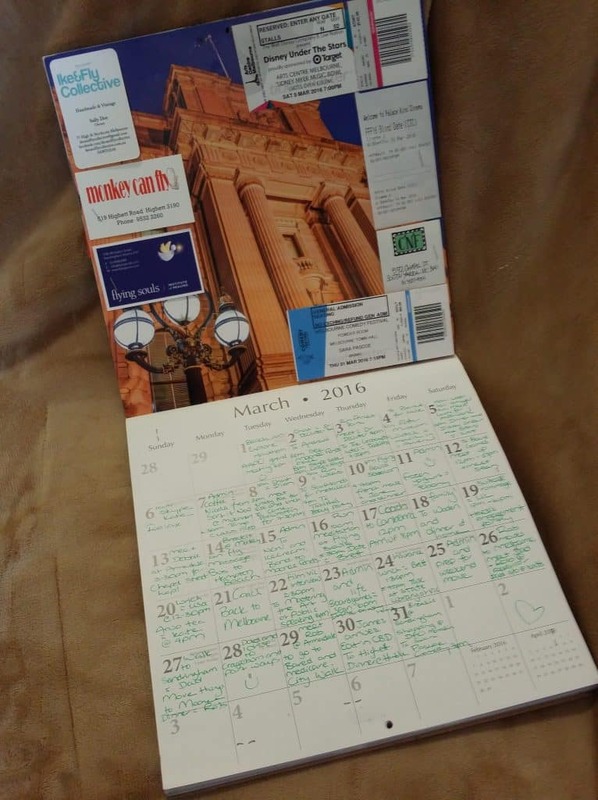 It wasn’t until I was inspired by a friend’s method of stapling her tickets and business cards to her wall calendar that I combined these two habits of mine and the change in connection to my memories was phenomenal. 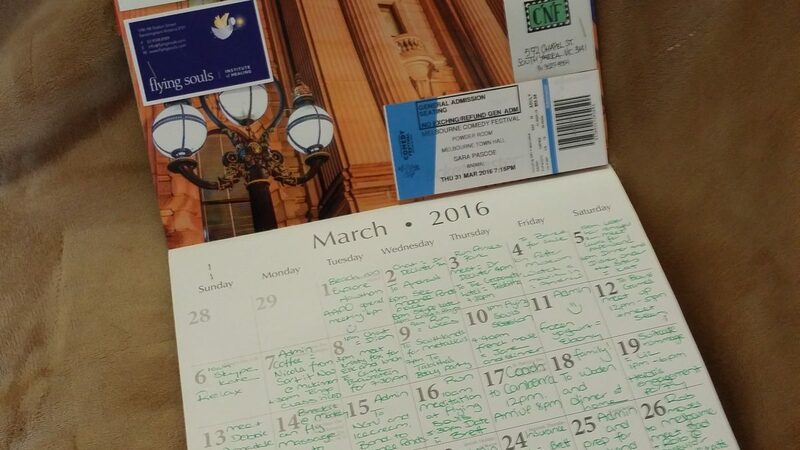 C) I then collage and staple the mix of memorabilia to the calendar pages (see above photo). If you’re wondering about what I do if there’s an exceptionally busy month – well, I get strict. If something won’t fit on the page or will cause the calendar to bulk too much it gets tossed or I have two things from one event (for example – if I have a show booklet and a ticket I will keep the ticket and not both because the ticket will fit better). So far this policy hasn’t failed me yet and my calendars have remained bulk free and easy to store. I find that this process gives me time to reflect about the last month and I get to visually see where an event fit in my life timeline (especially if something significant occurred). An additional bonus is that I rarely forget a great restaurant’s name anymore! Ah, yes, the eternal conflict of sentiment and comprehensibility …..